Great product!! Study, Awesome color and just the right size for my dog to get on and off!!! Incorporate a trendy blend of color with a mid-century design into your bedroom with this Gautestad Upholstered Queen-size bed. Available in your choice of blue or grey, this bed features a low-profile construction which conveys a simplistic functionality that appeals to modern tastes. Dimensions 70.0 In. X 43.0 In. X 4.0 In. When this bed came in the mail, I did not have high hopes; the box was severely dented and the corners were shredded. In fact, I could see the bed through the box. Despite the damaged box, the bed frame itself was completely fine. I was able to put the bed together on my own, but it did take me about an hour and a half from start to finish. If you don't have your own drill, it might take you much longer. In addition to hex screws, there are phillips head screws that come with this frame for added support, as well as screws to keep the slats in place. My set of slats (tethered together to guide spacing) were glued out of order. I was able to cut the ribbon that held them together, which was a fairly easy fix. Overall, this bed has been really sturdy and lived up to the photo. It is BRIGHT blue, which looks lovely with our grey/black bedding, but be forewarned that it's not a subtle color at all. I'd give this bed 5 stars if it weren't for the fact that the queen size frame is actually a bit larger than our queen size bed and you can see about 2-3 inches of slats from the side of the bed. I was able to cover it with bedding, but it does take away from the design a bit. This bed is beautiful, great mid century modern- It took me a few hours alone to put it together, whoever designed it meant that it was not going anywhere. there are so many bolts, washers and screws- I mean a lot- very sturdy.... I bought a queen for a guest room, after i bought another bed for my room(king). I wish I would have found this first. It is big and sturdy! I did not think about the extra 4 inches that the frame adds to *each* side and end of the bed. Keep that in mind. It is quite a nice-looking bed! I ordered 2 of these beds! I rec'd 1 complete bed and 1 bed with the 3rd box missing with the center rails and legs and support! Waiting on Overstock customer service to contact me and requesting to receive the missing parts! I love the quality and construction of this bed! The legs on the bed are beautiful and this bed has very clean lines. Love it! We've been using this bed for 6 months now, and I'm as happy with it now as I was on day 1. It's a solid construction and the grey fabric is stunning. Sturdy and beautiful bed! Love the color! We bought this in grey and love it. Like the way it looks, it is modern, the headboard is comfortable, and the materials feel well-made. We've had it for about 6 months and has held up well so far, couldn't be happier. The bed looks great I have just had it a couple of days. The installation took around 3 hours probably a lot quicker if i had used a drill, wood screws in the slats was a bit tedious. Also one of the slates didn't line up for the pre bored screws so I am going to have to bore it or leave as is. All and all I am very satisfied with the purchase, the only thing that worries me is the slanted support feet and the center support feet didn't touch the floor so I used cardboard to keep them from bouncing. This is a very eye catching bed with a mid century flare. Is made of good quality wood and is very sturdy. You most assemble but it wont take more than an hour with the help of a screwdriver drill. Upon delivery, i realized I was missing hardware as well as other essensial parts. The manufacturer pomptly send me the mising parts. It was a bummer to have to wait to put the bed together but in the end I am very pleased with the product. Beautiful bed. The middle legs do not touch the ground, which makes the mattress sink a bit in the middle. After spending 2+ hours of installation, we could not put together the furniture because several connecting pieces were missing in the package. The headboard arrived with a damage on the back as well. 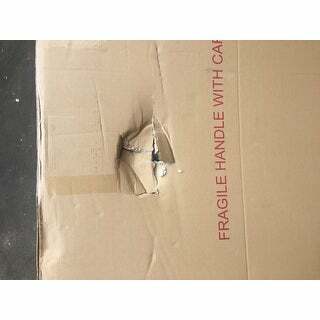 This is 3rd furniture from Overstock.com that we were not able to install due to damage / poor quality control. 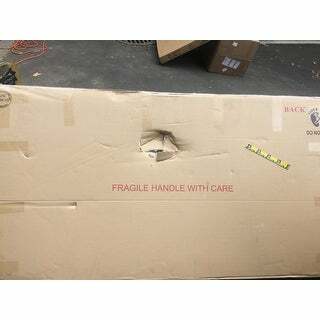 Why ship packages if crucial components are missing? Please do not spend time ordering this furniture. In total I spent 2 hours waiting for delivery, another 2 hours in trying to assemble, another 1 hour packing the times back to the boxes, and baby sitting the packages until UPS driver comes for a pickup. I have all positives to say about this product. It arrived 5 days earlier than anticipated. The quality of this frame is very well made and the color is dead on with the picture shown. My Son put it together in about 1.5 hours. This bed is so sturdy! It takes a bit of work to get it together but it's sturdy and strong plus I LOVE THE COLOR! I put it with a black and white rug and I'm in love. I highly recommend this bed to those of you who are going for a modern look. The unique design coupled with the angled legs makes this a focal point of any bedroom. This is a very sturdy bed, and for the price, is an exceptional buy! I love this bed and it looks great, I've received a lot of compliments on it. The blue is beautiful and pretty much exactly as pictured. The building process isn't bad, I was able to do it alone with no issue, and the bed is very sturdy. Love the color. Excellent craftsmanship, sturdy, easy to put together. Looks GREAT! best frame ever super sturdy and at a good price. You need two people to assemble it but the instructions are pretty clear. It took one hour to assamble it to me and my friend. a power tool might be useful but not necessary. "What type of fabric is this"
The fabric for this bed is polyester. "Could you tell me if the yellow is as bright and sunshine-y as depicted in the photograph? How would you describe it - lemon or mustard or some other"
"Does the center support legs touch the floor? A few have commented they do not. If not, how are they useful? Thanks." The center legs are adjustable. If they don’t touch the ground when tied all the way, they can be loosen a bit. Their main purpose is the provide extra support when someone is on the bed as the slat system has some flex by design and at that point the center legs help. "Does this come in a full or CalKing size?" "Do you have this in full size? I thought I’ve seen it before, but I can’t find it again." "What's the internal dimension of the mattress frame out - not total width & length? I want to ensure that there isn't any gaps between frame & mattress for a standard 60" x 80" queen size mattress." There is about an inch of space on the side. "I would like to order this in gray color please, is it possible ? " The Blue and Grey options are out of stock now. ETA is first week of June.